The Independent India: Students cheat because our education system values marks more than morals! Students cheat because our education system values marks more than morals! This is the bitter truth of the current Education system present in India. As in our education systems the thing matters the most is the "marks" the genuineness of the marks is no more valid the thing only valid is 90%+ on mark-sheet.And the strange thing about all this is that all this is happening in the country where the birth of people like "Mahatma Gandhi" take place The man who had not cheated in his exam even his teacher asked him to cheat.But the condition of current India is totally opposite the students are cheating and we would have to accept this bitter truth and the #1 reason for this situation is that our education system values marks more then the morals. 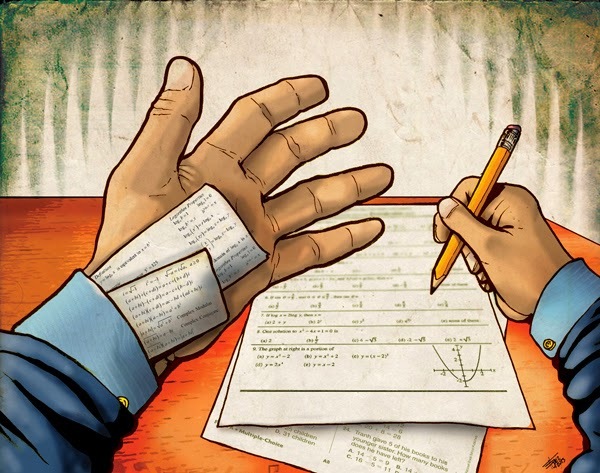 Why are students cheating ? This is not a mistakes of students and students cannot be blamed for all this because the thing is that the children are doing what we are expecting from them we are expecting A grades from the students our first aim is that the students should get top grades we are not bothered about the method of achieving the grades , we are not bothered about building the moral in students, we are not bothered about teaching students the Power of Truth. some short reasons why students are cheating. Fear of parents-Students are afraid of there parents regarding the marks they are afraid of there super strict parents. Grade below A make students and parents feel insulting and this is a very strong reason because this is the point of view of our society that if a student is receiving A grade then he is good else he is a fool. The competition is of marks and not of knowledge and the knowledge of a student is judged only on the basis of marks in India. Numbers are important how you achieve them don't matters. The student starts cheating then generally this is his/her first step towards "lies" he/she is going away from truth and this is the starting of becoming of loops holes in the sheet of truth. How we can prevent all this? If the students are taught the proper moral values with the academics then there occurs the chances of improvements. Every student takes birth with a different IQ and hence we cannot 90% marks or A grades from every student so if we stop forcing the students for scoring then this may result in improvement. If the examinations are viewed from the point of view of self judgement then there are chances of improvement. It's not mistake of education system. Our traditional mind force our child to get big number in exams. We should change our mind and concentrate on providing knowledge which help child to developed the skills.